I am working in the Live Animal Unit, having recently become a weekend manager. Behind me, I hear the sounds of someone walking into the room, talking as he enters. I turn to see who he’s talking to, and am surprised to find that he’s more or less talking to me. I stop working and watch him move around the room, talking the whole time as he checks in on certain animals, fiddles with other stuff, grabs some things he needs, and leaves via the back entrance to the room. I blink. I’m not sure who he is, if he was allowed to be in here, or what exactly just happened. This is my first introduction to Anthony Paino. It’s Memorial Day weekend, and one of our skunks in the Crazy Critters exhibit is having a grand mal seizure. I seriously have no damned clue what to do. I’ve crawled into the exhibit space and am cradling the unresponsive skunk. His name is Classic, I’ve helped raise him from a baby, and he’s in shock. Ant runs up. “I’ll go get a carrier.” He runs off do that. Visitors are commenting on how nice it is that I’m keeping the skunk company. I’m so glad Ant is here to help me. Our animal center’s coyote, Chinook, has gone to live in Maine, away from cities and concrete enclosures. Ant has put together a trip to visit Chinook in his new home. It is a frenetic adventure and of the four of us, only one will ever make this trip again. More than once. And that person is Ant, because he loves Chinook enough to drive into the wilds of Maine over and over again to check up on his friend. Ant and I are walking to Starbuck’s to get a mocha before the museum opens for the day. He is not someone that one would say needs coffee; he’s always animated, always seems to be moving. But he’s introduced me to the joy that is Starbuck’s, and this quick walk down the street to get an overpriced mocha is maybe one of the best parts of my day, because he’s kind and friendly and makes me feel included in a way I generally don’t feel. This is the Ant that lives in my head, in a snapshot of a world that no longer exists. If you’ve ever visited the Academy of Natural Sciences up to about 2011 or so, you’ve probably encountered Ant in Dinosaur Hall, doing a natural history demonstration, working with the Women in Natural Sciences program, or handling one of the myriad small jobs a museum manager encounters every day on the job. A few weeks ago, I learned that he’s been struggling a lot. The doctors don’t know what’s wrong with him, but they suspect it’s a rare condition called chronic inflammatory demyelinating polyneuropathy (CIDP) – his immune system is attacking his nerves, leaving him so weak he is struggling to do things as simple as eat, or stand up if he falls down. You probably haven’t heard of this condition before, but it looks a little like MS..or stress. Which is why his doctors are having a hard time actually diagnosing him. His health has deteriorated over the past few years and he needs help. A lot of help. There’s a fundraiser for him here: https://www.youcaring.com/anthony-paino-your-favorite-former-non-profit-naturalist-458373 You’ll see that the request is for money, and for other things as well. Tis the season, of course, where we are inundated with pleas for help. And honestly, too many of us are a paycheck or two, or just one health crisis away, from needing help ourselves. I’m boosting the signal for this request because Ant is truly one of the best, kindest, most dedicated people I’ve ever known. I have zero doubt that he would do anything in his power to help his friends. So we, his friends, are doing everything in our power to help him. Because of Ant’s health, he’s been unemployed for too long. We all know how terrifying hospital costs are even if you *do* have a job. So. This your daily chance to do good, y’all. Even donating the cost of a Starbuck’s mocha would help. If you can’t help? Please consider boosting the signal. This past Sunday was what might be my last 5K of the season – maybe my last one ever. Not because of this experience, but because overall I feel…well, a little silly. A little defeated. More than a little convinced I could be getting the same actual workout by going disc golfing with my husband. Sunday was World Run Day. I signed up over a month ago to do the Dirty Herd 5k up at Pretty Lake, Mattawan, partly because it was sorta kinda local, partly because money raised goes back to Pretty Lake Camp and its work with at-risk kids, and partly because the name of the group made me laugh. Bones had a thing to go to as well and somehow from agreeing the night before that us leaving at 8:30AM was fine to when we actually started to leave, I panicked and announced I would never make it on time. This was to be true in ways I couldn’t anticipate at that point. We got Bones to his thing a bit early, and me to my thing on time. As in, the runners hadn’t left yet. But by the time I figured out where registration was (“Oh, we already shut down! Hold on…”), confirmed that yes I still wanted to do the walk, and made it back outside, everyone was gone. “Oh! Sure! You’re just..let’s see…about 11 minutes behind the group. I started down a road. As it turned out, this would be the only paved path for the entire walk. Initially there were white arrows painted on the road, but as I turned onto a dirt road, that wasn’t the case. I fairly quickly found my path blocked by plastic orange tape, with no obvious markers telling me where to go next. This was the…well, the fifth time that morning that I seriously considered not doing this silly thing. I could have totally ditched and no one except Bones would have known. I next considered crying out of frustration. I finally decided to just duck past the ribbon and keep walking. Worst case scenario, I figured, was that I’d have a nice walk around Pretty Lake. I hadn’t seen any blue ones yet, but I thanked them and continued..and finally did find where the path broke off. This album gives you an idea of what the start of this event looked like. (I never saw this many people. Alas.) What isn’t shown is that the trail took us off road and into the woods. It was gorgeous and just hilly enough to make my calves ache for a day or so afterwards….and honestly, it was a little nerve wracking to be alone in the woods so afraid of falling. My right foot is still not fully healed from all my falls last month. 😦 But! I did not fall! A lot of the trail followed ones they clearly use over the summer, and people that know how to read trail markers would have felt more comfortable than I did, as those trail markers were frequently placed and highly visible. And it was honestly so lovely. Even with my feeling nervous about falling, I loved this location and trail, and kept thinking that Bones should be there because he would have really enjoyed the hike. At the same time, I started thinking that yeah, I could probably get the same benefit from walking along with him while he’s disc golfing…so, there’s that. I did finally start to encounter people doing the 10K, and I passed one walker (!!!! ), so I’m pretty sure I wasn’t DEAD last. 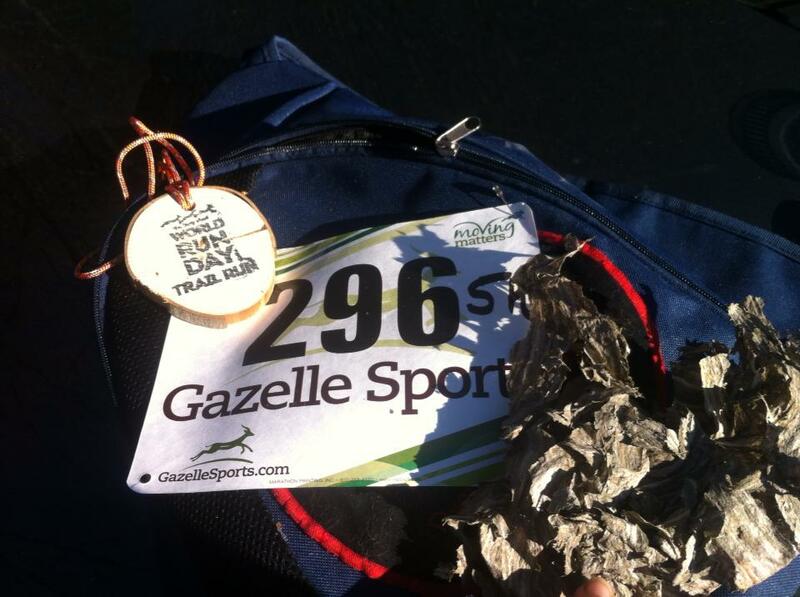 We didn’t have timing chips on our bibs, but I think my total time was probably my worst one yet – just over an hour. OTOH, it was hilly and I got lost and I’m actually ok with my time being not too speedy. I had a lot of time to think about my 5K fixation and just as I was thinking to myself, ‘This is really stupid. Everyone knows you’re slow. You’d rather be riding a bike. You’re not ever going to run. Hell, walking is a challenge! What the hell are you doing? This is your last one,’ a 10K runner passed me and said hi. I looked up and saw he had a prosthetic foot. I assume he also managed not to fall on this trail. Will I do another 5K? Maybe. Is it in part because I got another medal? Several years ago, the ever-magical SJ Tucker found herself in need of emergency medical care and, being an uninsured musician, this was a pretty scary financial monster to face down alone. Fortunately, she didn’t have to. A collection of varied bits of creativity was put together under the title Ravens in the Library and all proceeds from the sales went directly to help cover s00j’s medical costs. It was an amazing act of love..and it was a smashing success. Pre-orders for Angels of the Meanwhile are being taken now, in a pay-what-you-wish format, here: http://alexandraerin.dreamwidth.org/636831.html. 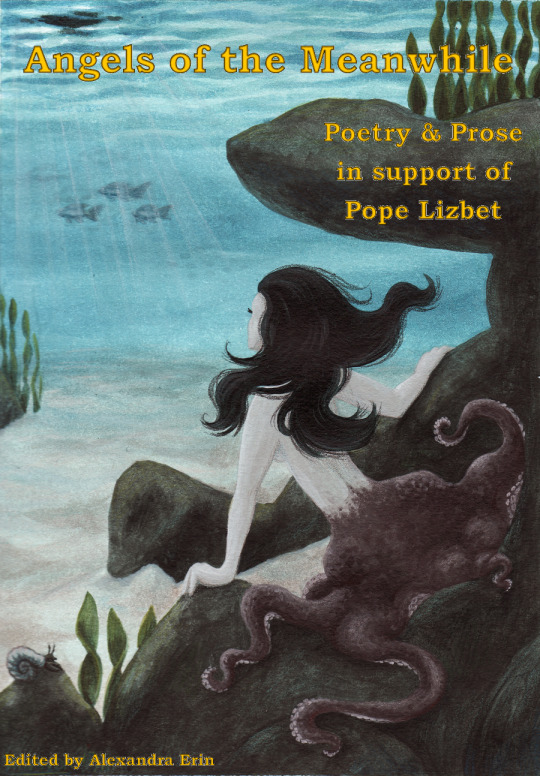 Please note that the final e-chapbook won’t be available until June; pre-orders are being taken for some emergency fundraising in relation to Elizabeth’s surgery, so you’re very encouraged to order NOW, but you’ll have to wait a bit to actually get your hands on the finished product. I’m very happy to be a very small part of this project. Popelizbet has done a lot of really good things for a lot of really good people…it’s lovely to see her community coming together to help her now.